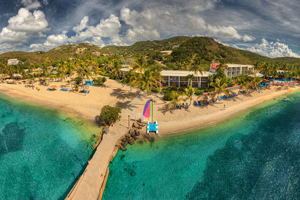 The Caribbean’s best bars have three things in common: cold beer, a potent rum punch, and a killer view of the sea. If there’s also sand cradling your feet while you kick back and hear a live band, you’ve hit the jackpot. Here are our picks for the 10 best bars at Caribbean ports of call, from Aruba to St. Martin. Some are dive bars where the cocktails are cheap and the crowd is a hoot; others are low-key, sunset sipper-style spots. This ultimate party bar gets the festivities started early and stays open late. Bartenders keep busy both blending drinks and entertaining the crowd with jokes, and bursts of song accompany live music. What to Drink: Margaritas, of course! There are over a dozen varieties to try, including the unusual coconut peanut butter-chocolate special. The pours are large and get bigger, the more you tip. Located on a beach at the end of Princess Juliana International Airport’s runway, this bar attracts visitors for plane spotting and its anything-goes atmosphere. We’re talking a raucous beach party where bikini tops come off in order to score a free drink. What to Drink: Prepare to be blown away — literally. If you indulge in too many $2 vodka-and-juice “take-off" shots and wander too close to the blasts from jets flying overhead, you'll feel it. Maybe stick to the $3 Carib beers. It’s worth the 30-minute taxi ride to spend the day bouncing between the beach and the bar at this high-energy spot that’s popular with locals, especially on the weekends. Bring $5 to take a picture with the resident monkey. What to Drink: The Reggae Colada is made with passion fruit, rum, and coconut cream. But Kittitians usually order a "Ting with a Sting,” made with Ting grapefruit soda and Cane Spirit Rothschild, local moonshine-like rum. 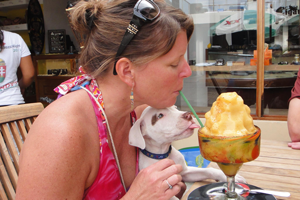 This bar may be a ferry ride from St. Kitts, but it would be hard to talk about beach bars without mentioning it. Despite being next door to the uber-fancy Four Seasons Resort, Sunshines is totally chill. The open-air, beach-front bar is decorated with a mass of license plates from previous patrons, and tons of photos from celeb guests. Seating is living room-style with a separate picnic pavilion for those who want to be barefoot in the sand. What to Drink: Sure, you can order local beers like Carib, Skol, and Stag, but everyone — from Beyoncé to Kevin Bacon — goes to Sunshines for its famous Killer Bee cocktail. The exact ingredients are a secret, but owner Sunshine fesses up to passion fruit juice and rum as the starters. The first cup will give you a nice buzz. Anything after that? You’re guaranteed to be stung! One of MoBay’s popular waterfront nightspots is also great during the day, thanks to the open-air bar that attracts the cruise crowd. Not only will you find music, but also a dance floor in case Bob Marley’s spirit moves you. What to Drink: A rum punch is a must-drink when in Jamaica, and it must be made with the island’s Appleton liquor. But if you’re a beer drinker, Red Stripe is the way to go. 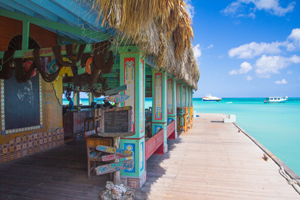 This thatched-roof, colorful bar built on a pier is a popular daytime watering hole, so if you go for sunset, go early to grab a good seat for the live band and Mother Nature’s show. What to Drink: The local brews are Balashi and Amstel Bright. However, if you’re in the mood for a mixed drink, order the beloved Aruba Ariba — a sweet concoction of rum, vodka, banana liqueur, triple sec, and fruit juice. As with many dive bars, this tiny hole-in-the-wall won’t win any design awards — though the vintage jukebox and graffiti-covered walls could almost be considered art after a few drinks. Cruise staff on break hang here, grateful for Puerto Rico’s cheap Medalla beers. What to Drink: Don’t even think about asking for a blended anything. The employees aren’t “mixologists,” but if you request a michelada — a bloody mary-type drink made with beer, lime juice, salt, Worcestershire sauce, hot pepper sauce, and tomato juice — they’ll oblige. This is a family-friendly beach bar where daytime means kicking off your shoes and digging your toes into the sand, swinging in a hammock, or getting into a volleyball game. Or simply grab a lounge chair and bask in the sun — tiki mug in hand. At night, live music pumps up the crowd, and the scene becomes Carnival-style with steel pans, limbo dancing, costumes, and games. What to Drink: The Bushwhacker is the quintessential U.S. Virgin Islands drink — a boozy milkshake-like mix of vodka, rum, Baileys, amaretto, Kahlua, and coconut cream. But those with a daring spirit — and a strong liver — should try VooDoo Juice, made with five rums and a “splash” of juice served in a special bucket. If you can drink more than one without speaking in tongues, consider us impressed. This natty, nautical-style bar is popular because of its marina location. Sailors can moor right in the harbor, head straight to the bar just a few feet away, and talk story. There’s also the waterfront Pusser's Road Town Pub near the cruise port, should you want to stay closer to the ship. What to Drink: You must have a Painkiller® cocktail (served in a souvenir naval cup!) when in Tortola. The mix of BVI-made Pusser’s rum, orange and pineapple juices, and cream of coconut goes down easily but packs a punch. The self-proclaimed “Official Bar of the Bahamas” is near the bay, so the yachtie crowd loves it there, and locals do too. It’s not fancy, but listening to tall fishing tales from sun-weathered hobbyists and bursting into song when the live band plays on weekends are a blast. Plus, ladies are treated to free drink specials. What to Drink: Kalik, the Bahamian beer, is always a favorite, as well as the rummy Goombay Smash — the islands' national drink. For something different, try the Jamikaze, made with Stoli Razberi and blue curaçao mixed with the bartender’s secret ingredients. 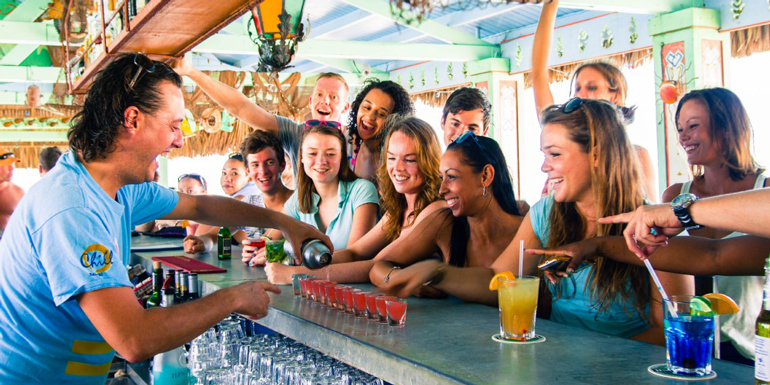 Painkiller is a registered trademark of Pusser's Rum Ltd.
What are your favorite Caribbean bars? Let us know! My favourite beach bar is Roots Bar in Marigot Bay, St Lucia, great local food, great cocktails and great company.